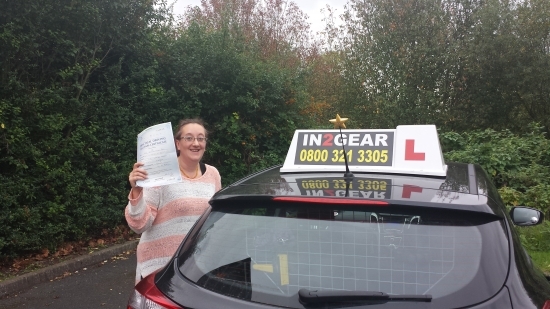 Jessica passed first time on the 10/10/13! "After a run of bad instructors in my early twenties I was put off driving for many years. After having my 3rd child last year at the age of 34 I felt it had become a necessity to learn to drive. I started my lessons in May 2013 with In2Gear after finding them online. My instructor Dom was fantastic. She explained things so well and made me feel at ease. I was initially very nervous but she was very patient and my confidence grew. I have just passed my test first time and am so happy that I now have gained the independence of being able to drive myself. Thank you so much Dom! I would recommend In2Gear to anyone".